The last few days have seen TWO’s duo, Marcus and Shona, down tools in the salon and head up to London to attend leading International hair education company, Allilon’s, renown ‘Primary Shapes’ training course. 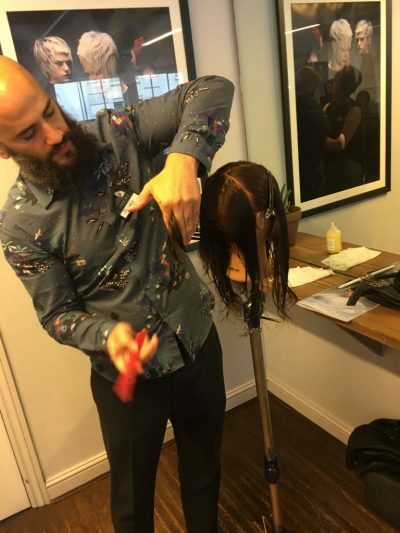 Located in the heart of London, Davine’s Flagship salon, Ena in Covent Garden, played host to the training course, which saw hair stylists from across the UK travel too, to learn more about this pioneering and innovative approach to hair cutting. Ran by Pedro, the course required us both to leave what we knew about hair cutting at the door and stripping it back to basics, which to start with was easier said than done we must admit. However within a few hours, and let loose on a mannequin or two, we could both see how the change in approach achieved what every single person who walks into our salon in Southsea wants… a great haircut. In it’s simplest form (and not wanting to give away too many trade secrets) all haircuts start with a basic shape, and from this, you then develop the haircut. Sounds simple we know, and by the end of the training course, (which of course we both passed with flying colours), both of us knew we would be heading back to the South Coast with a new invigorated approach to every haircut we undertake.